Skull - Visual Dictionary - Copyright © 2005-2016 - All rights reserved. [img]https://infovisual.info//storage/app/media/03/img_en/014-skull-anterior-view.jpg[/img] [url=https://infovisual.info/en][/url] - [url=http://www.infovisual.info/]Visual Dictionary[/url] - Copyright © 2005-2016 - All rights reserved. Skull (anterior view): bony case of the brain of vertebrates. Superciliary arch: arch like bone situated at eyebrows level. Frontal bone: bone of the forehead. Glabella: part of the skull between the eyebrows. 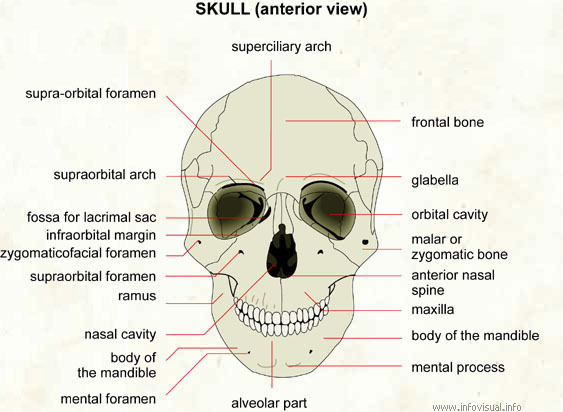 Orbital cavity: hollow part of the skull which contains the eye. Malar or zygomatic bone: cheek bone. Anterior nasal spine: long, projecting part of the nasal bone. Maxilla: bony upper part of the jaw. Body of the mandible: bony upper part of the jaw. Mental process: the part of the mandible that forms the chin. Alveolar part: edge of the buccal cavity, into which the teeth are set. Mental foramen: cavity of the chin. Body of the mandible: main part of the mandible. Nasal cavity: skull opening related to the nose. Ramus: bony part connecting the mandible to the skull. Supraorbital foramen: cavity below the orbit. Zygomaticofacial foramen: cavity related to the cheek. Infraorbital margin: lower edge of the orbit. Fossa for lacrimal sac: opening of the tear duct. Supraorbital arch: arched bone forming the upper part of the orbit. Supra-orbital foramen: opening above the upper part of the orbit.